우리 뭉이 그림이다. 뭉이는 오빠네 집에 사는 내 조카같은 귀염둥이 래브라도. 요즘 컴퓨터로 그림그리는 재미에 빠져 이것저것 그려보는 중인데, 아이패드에 에플펜으로 그리면 더 좋겠다는 생각이 들지만 (악마야 물러가라 ㅋㅋㅋ) 그래도 마우스로 느릿느릿 그려보는 것도 참 재밌다. 뭐 내가 미대출신도 아니고, 그렇다고 뛰어나게 그림을 잘그리는것도 아니지만 뭔 상관인가? 그냥 재밌게 그림을 그리면 그걸로 되는거지. 오늘은 아줌마 포스팅은 아니지만, 뭉이 그림을 올리고 싶어서 뭉이그림을 올려본다. 아줌마 얼굴을 시리즈별로 그려 올려보는 것도 좋을것 같다. 해야할 일이 참 많은데, 게을러진다. My drawing is not perfect and I just draw for fun but who cares? 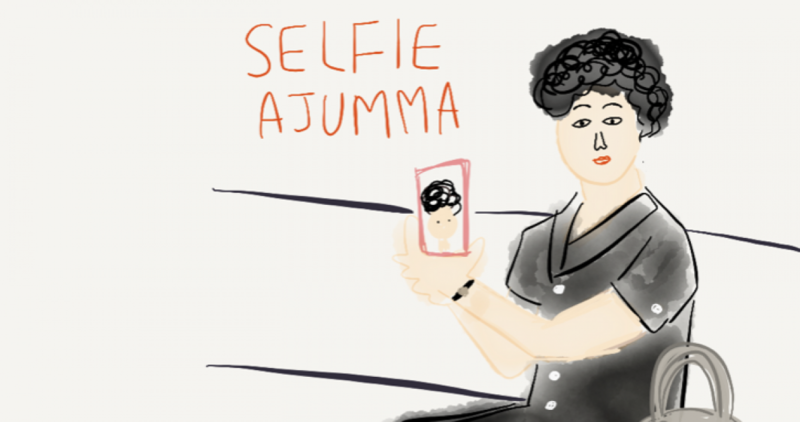 (: Today I won’t post ‘Ajumma’ related blog post but I wanted to put my adorable Mung’s painting on my blog. I’m thinking to draw a variety of Ajummas’ faces. So many things that I’ve planned to do are waiting for me and it is time to ‘DO’.